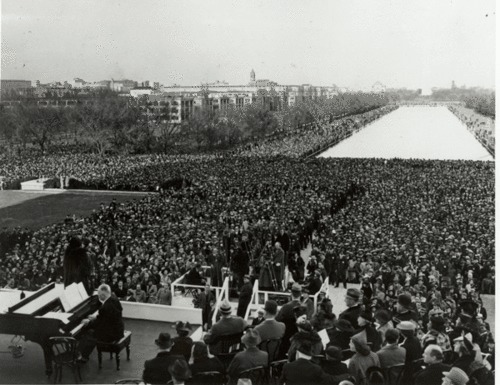 “Marian Anderson concert at the Lincoln Memorial,” Histories of the National Mall, accessed April 22, 2019, http://mallhistory.org/items/show/101. African American contralto Marian Anderson sang on the steps of the Lincoln Memorial on Easter Sunday, April 9, 1939. A peaceful crowd of seventy-five thousand people stretched from the Lincoln Memorial to the Washington Monument to attend the free concert; thousands more tuned in to listen on the radio. The Daughters of the American Revolution had barred the world-renowned singer from appearing in Washington's prestigious Constitution Hall because she was African American. First Lady Eleanor Roosevelt and Secretary of the Interior Harold Ickes rallied support for her public appearance on the Mall, focusing public attention on racial discrimination and inequality.